The present day scenario of prefabricated housing (manufactured and modular homes) is highly considerate and advanced. 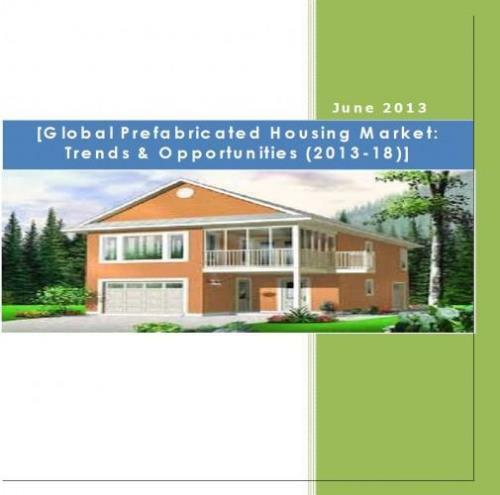 This new report titled 'Global Prefabricated Housing Industry: Trends & Opportunities (2013-18)' analyzes the potential opportunities and significant trends in the global prefabricated housing market. The report analyzes the market of United States, Canada, Japan, United Kingdom and Australia. It assesses the various factors driving the prefabricated industry such as the increasingly significant 'eco' factor'. Also looked at are the various segments and sub-segments of prefabricated houses and their shipment in major markets. The report further profiles and analyzes the business strategies of the leading companies operating in the prefabricated housing industry. This new report represents an up-to-date and informed review of this changing and complex market. The developed nations like United States, Canada, United Kingdom and Japan are the biggest trade centres for prefabricated house manufacturers. The attractive features of a fully furnished house, mainstream locale, low housing costs and the concept of being build in a controlled environment manner have been the primary factors fuelling the market of prefabricated housing and manufactured homes. Players like Clayton Homes, Commodore Corporation, Cavco, American home Store has been catering to the prefabricated industry for years. In recent times, the prefabricated housing industry has witnessed a trend of ‘Green' identity, which focuses on an affinity towards eco-friendly, energy efficient and waste management features of the building structure. The continuous technological advancements and improving economy should play a crucial role in driving the demand of manufactured housing and modular homes in the future.